Finding a good plumber before you need one will save time, stress and money. Puget Sound Consumers’ Checkbook’s surveys of local plumbing outfits turned up dozens of excellent options in the area. Here’s what they suggest to get the best work for your money. Plumbing is seldom exciting. It works fine for years, faithfully filling, flowing and flushing. But when you get a clog or a pipe leaks water through your ceiling a few days before your holiday guests arrive (or, worse, after they arrive), the excitement may become more than you can stand. Even if you’re stressed, don’t panic and dial a number you remember from a radio jingle — big ad budgets don’t indicate great service. Instead, now take a few minutes to find a plumber who will get the job done right for a fair price. For the next month, Checkbook is giving readers of The Seattle Times free access to its ratings of area plumbers. Puget Sound Consumers’ Checkbook’s surveys of local consumers turned up dozens of excellent plumbing outfits in the area. Several of the companies evaluated by Checkbook were rated “superior” overall by at least 90 percent of their surveyed customers. After you have identified high-quality, reliable companies, you need to consider price. To rate companies for the prices they offer, Checkbook’s undercover shoppers called the companies and requested price quotes for eight plumbing jobs. Prices varied dramatically for the same work. For example, prices to supply and install an InsinkErator Premier Badger 5 garbage disposer ranged from $300 to $875 — a difference of $575. To supply and install a Bradford-White RG250T6N 50-gallon water heater, prices ranged from $898 to $1,800 — a difference of $902. If you have a large remodeling job — a new kitchen or bathroom, for instance — getting several bids is especially critical. Not only is a large amount of money at stake, but the percentage variation in prices on such major jobs is larger than the variation on smaller installation jobs. Checkbook’s undercover shoppers obtained bids from local companies for a complete remodel of a large master bath and received price quotes ranging from $26,000 to $61,000. The message is clear: Even for small jobs, it’s worth your time to shop around. You don’t have to pay more to get good work. Checkbook found that many of the companies that rate best for the quality of their work also are among the lowest in price. • Provide an exact description of your problem. • Ask each company how it computes its labor rates (minimum charge and what it includes, price per hour after the minimum, etc.). • Try to get an estimate of how long it usually takes to do your job. • When the plumber arrives, review the labor rates you were provided. This will eliminate misunderstandings and may enhance timekeeping accuracy. • Clear the area. You don’t want to pay a plumber $100 an hour to clean out junk from underneath your sink. • Don’t let conversations with the plumber interfere with the work. 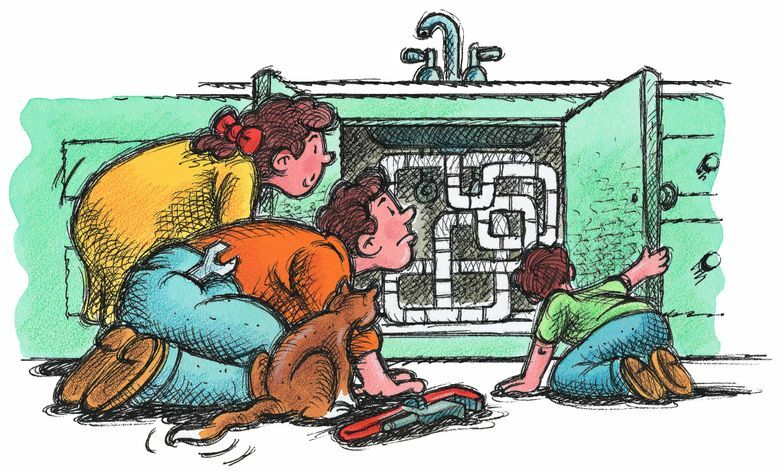 While it is important to understand what the plumber is doing, there is a reasonable limit. Remember that the plumber is on the clock until he or she writes up the ticket. • A fixed price for all work. • Exactly what you want done, including makes and model numbers of all fixtures. Plus who breaks up the floor, cuts holes in the wall, patches floor and walls, hangs the sink, performs the carpentry, hauls away debris. • Location of fixtures and where pipes will run. Sometimes a few inches can make a big difference in the difficulty of a plumbing job. If you have not spelled out what you want (ideally in a sketch or plan), you may meet a lot of resistance when you want your sink installed just a little to the left to make room for a wastebasket. • That the contractor will secure required permits and inspections. • When work is to begin and approximately how long it is to take. • Warranty. For remodeling work, materials and workmanship should be warranted for at least one year. • Arbitration clause. While this request might put off some companies, a company accustomed to doing sizable jobs will see it as a possible cost-saver for both parties, should a dispute arise. • Payment schedule. Companies that let you withhold a substantial portion of the price of an installation job until completion indicate that they are confident they can satisfy you. And you also get leverage to prod the company to do the job right if you are dissatisfied. Puget Sound Consumers’ Checkbook magazine and Checkbook.org is a nonprofit organization with a mission to help consumers get the best service and lowest prices. We are supported by consumers and take no money from the service providers we evaluate. You can access Checkbook’s ratings area plumbers free of charge until Feb. 7 at www.checkbook.org/SeattleTimes/plumbers.